An exoplanet is a planet that orbits another star other than the Sun; since 1988, approximately 2000 of them have been confirmed. This post, inspired by Ethan Kruse‘s Kepler Orrery IV, visualises and animates exoplanets, together with their habitable zones. The data come from the NASA Exoplanet Archive and it only includes the confirmed exoplanets with known orbits and temperature. 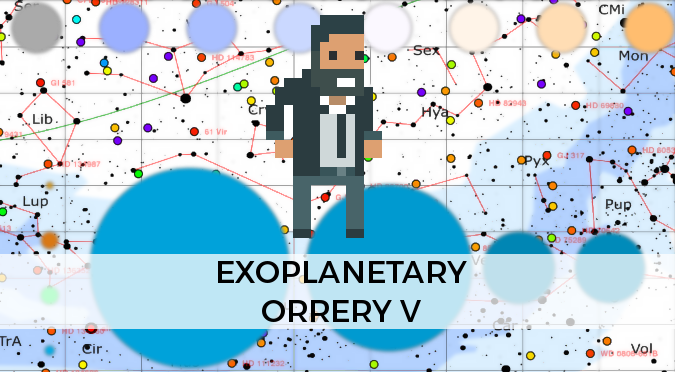 You can find a complete list of all the exoplanets here. Before introducing the exoplanetary orreries, this is the inner part of our solar system. The orbital distances are to scale ( ), but the size of stars and planet are not. This is because celestial objects are incredibly tiny compared to the distances of the Solar system. The diagram below shows the relative size of the planet ( ). For these orreries, the square root of the size of the planets have been used for a better visualisation. The green area indicates circumstellar habitable zones, regions around stars that receive enough light to allow for liquid water to form. For each orrery, the inner and outer bounds of each habitable zone are defined as and Astronomical Units, respectively (where is the star luminosity relative to the Sun). For binary systems, habitable zones takes into account only their primary star. The bar goes from (−273.15°C) to (=1226.85°C); the green area runs from (0°C) to (40°C). The majority of these planets have been discovered by transit photometry; a technique which detects the drop in luminosity that a star suffers when is eclipsed by one of its planets. Monitoring starts for long period is expensive, with the consequence that the majority of the exoplanets discovered have very fast orbits. Their orbital speed is to scale ( ). In these orreries, stars are always assumed to be in the right focus of the elliptical orbits. Planetary initial positions are synchronised so that when they hit zero degrees, they transit in front of their stars, from the Earth’s perspective. The colour of a star reflects its spectral type according to the Harvard spectral classification. Temperatures are expressed in thousands of Kelvin ( ). The bigger the planet, the easier it is to be detected; this explains why most of the confirmed exoplanets are very large, often bigger than Jupiter. Many of these systems are likely to have smaller planets which have yet to be discovered. HIP: High Accuracy Radial velocity Planet Searcher for the Northern hemisphere (HARPS-N). Check a complete orrery list here.